Based on data collected by Holden Research and Consulting on a trial of Huma Gro® foliar programs on Portola Strawberries in Ventura County, Calif., the Huma Gro® treatment program resulted in both higher yields and a higher percentage of marketable yield than the grower’s standard program, resulting in an overall yield increase of 13%. This yield increase resulted in a return-to-the-farm increase of almost $3,500 more per acre, a 14% increase in dollars back to the farm. 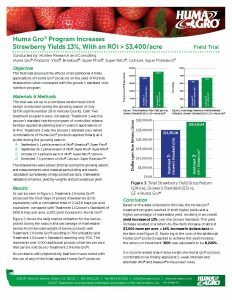 Factoring in the cost of the additional Huma Gro® products applied to achieve this yield increase, the return on investment (ROI) was calculated to be 8,226%. It is recommended that in future strawberry trials, Huma Gro® product combinations be foliarly applied at 2-week intervals and alternate Vitol® and Breakout® in the product mixes. Come see us at the Southwest Ag Summit at Arizona Western College in Yuma, Arizona, on February 25–26. Ray Speakman and Nathan Smith will be there in Booth 52 to answer all of your Huma Gro questions. For more information, go to www.swagsummit.com. Come see us at the 20th Annual Commodity Classic at the Phoenix Convention Center in Phoenix, Arizona, on February 26–28. Alan Merrill and Johann Buck, PhD, will be there in Booth 1438 to answer all of your Huma Gro questions. For more information, go to www.commodityclassic.com.